unlike certain "Your choice matters blah blah games" love it roll on end of aug for ep 3. This sort of reminds me of ME3! Where.. The Walking Dead: Episode 3 looks like it’s going to hit its promised release window. The latest instalment of the popular series will hit Xbox Live tomorrow. Due to the last-minute nature of the announcement, there had been some concern that the game would slip past the August release date promised by Telltale back in July, but it looks like it’ll just squeeze in. Titled ‘Long Road Ahead,’ the episode will see Lee and the gang move out of Macon, as the drama, tension and gore moves up another notch. It'll cost 400 MSP. There’s a trailer for the episode below, courtesy of IGN. i.e. the season will wrap up by then. 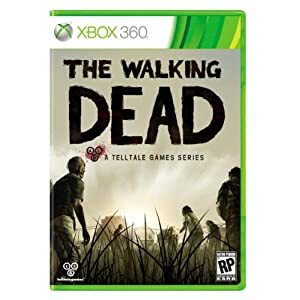 Telltale Games' gripping episodic zombie series The Walking Dead is going to be collected in one complete retail package coming to Xbox 360 and PS3 in North America on 4th December. The bundled release is heading to Europe too, even if no specific date has been announced. This information comes from Telltale's official twitter account where the studio replied to a fan asking if the series would come out on a disc. "As a matter of fact, yes!" the studio replied. "Entire season on disc. Dec 4th in NA for Xbox 360 and PS3. EU dates TBA." What's notable about this for European folk is it means the series will have wrapped up by then. So far each episode has been released close to two months apart, so it appears the next two chapters will be rolling in at an accelerated pace. That's great for us impatient types, but let's just hope these final two episodes - Around Every Corner and No Time Left - aren't rushed. Now the question remains, how are they going to top that thing that happened in Episode 3? Because holy f*** was that brutal. You know what I'm talking about, people who've played it. Very happy I've waited on buying this. I'll be picking up the disc on CAG. Currently listed on Amazon for $29.99 (US). This reminds me that I need to catch up on the TV series. Following the release of Around Every Corner a fifth episode, called No Time Left, will hit later this year, with a disc containing all five episodes set to arrive in December. Lovely stuff. ayeeeee oh my god im crying, im halfway done on ep 3 THIS GAME IS SO DARN DEPRESSING! Cant wait to goto the Panel at NYCC, Im going to ask if they played this game or not and what have they thought of it so far if they have..
Telltale has finally nailed down a release date for The Walking Dead: Episode 4 - Around Every Corner. It's slated for 10th October on Xbox Live Arcade, and will cost 400 MP. Zombie fanciers, rejoice! The Walking Dead is not only winging its way towards you on a shiny disc that will be sold in retail shops, but GameStop in North America is offering an Exclusive Collector's Edition of the disc-based release, which comes with a nice little extra. We say little, but it's actually pretty big. You get The Walking Dead Compendium One bundled with the game, both of which come with exclusive cover art from mainstay Walking Dead artist Charlie Adlard. The compendium collects issues 1-48 of the comic book, which translates to over 1000 pages of Walking Dead graphic novel goodness. The Walking Dead is completely amazing, by the way. You'll be able to snap it up on disc - assuming you haven't already voraciously devoured each downloadable episode - on December 4th in North America for $29.99. 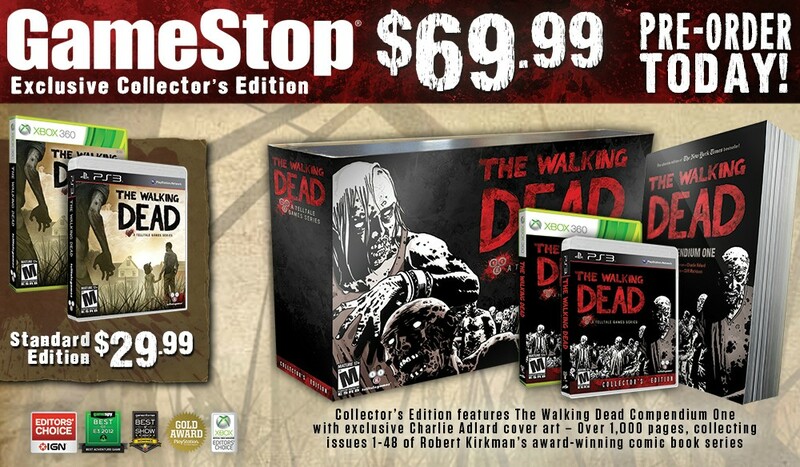 The GameStop Collector's Edition will set you back $69.99. An EU release date has yet to be confirmed. That's pretty awesome. The Walking Dead Compendium One is worth $30 by itself. The Walking Dead: The Game picked up top prize at Spike TV's coveted Video Game Awards 2012. The episodic title was named 'Game of the Year' and earned developer Telltale Games 'Studio of the Year'. It also won 'Best Adapted Video Game' and 'Best Downloadable Game', as well as a 'Best Performance By a Human Female' gong for voice actress Melissa Hutchison. Borderlands 2 was another big winner on the night, claiming the prizes for 'Best Shooter' and 'Best Multiplayer Game' in addition to 'Best Performance By a Human Male' for Dameon Clarke. Journey came away with a trio of awards, finding success in the 'Best PS3 Game', 'Best Original Score' and 'Best Independent Game' categories. Halo 4 took the gongs for 'Best Xbox 360 Game' and 'Best Graphics'. Rockstar Games' Grand Theft Auto 5 was named the 'Most Anticipated Game', edging out the likes of BioShock: Infinite and The Last of Us. The Walking Dead has racked up a whopping 8.5 million copies across all episodes and platforms. That’s according to TellTale CEO Dan Connors who told the Wall Street Journal that the first season of the episodic series reached the figure after just seven months. "November and December were our biggest months," said Connors. "It was the culmination of the product, the game of the year awards, the retail push and it still has a ton of head room in it." Meanwhile, TellTale is also looking at a way in which to make your choices in the first season of the game meaningful in the second season. "We are definitely figuring out how to carry the saves over," Connors told Red Bull UK.